Yesterday I checked on the guitar and sprayed a pass or two in a few spots that seemed to need it. One was a tiny pit that under light seemed to be white-ish. I was worried that it’s actually the primer, so I sprayed it. Another was a little speck. It wasn’t dust or a run, just a needle-head spot that had more lacquer than the rest. I thought that spraying over it can smooth it out. I also learned how to improve my spraying technique, and that changed my world. When I first started spraying, I’d be 15″ away from the guitar, and I would go sort of slow. The result was a lot more orange peel, and a lost of material lost in the process. Someone at OSG saw a picture of the orange peel and recommended spraying closer — at 10″ or 8″ away. I did that but I was also spraying slower, so I got a ton of runs. Now I settled on 9″ away, and my passes are fast. It’s hard to describe how fast, but I’d say fast but not so fast that your hand starts jittering. I think a good analog is wiping a wet counter. You don’t go too fast so it splatters water all over the place, but still fast enough to drag the water with you. Anyway, doing it this way saves a lot of lacquer, and the coats come out real smooth and thin. That brings me to my last point. A coat of black (= 3 passes) at 10″ away + a few touch ups require a little less than 6 oz. of black lacquer. 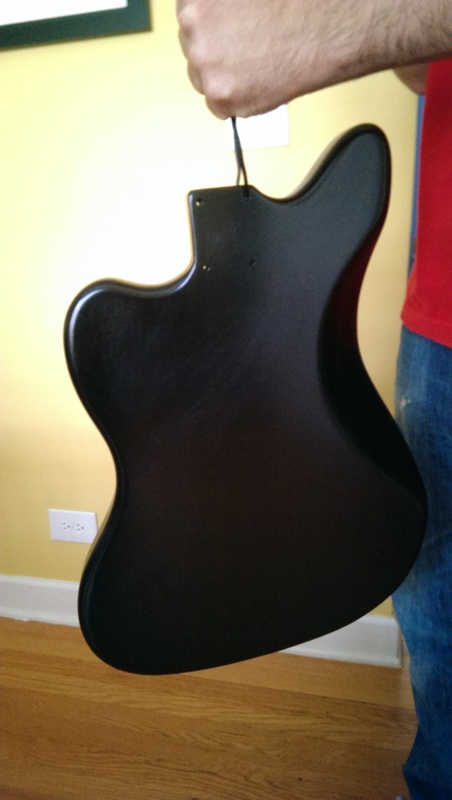 The lacquer is thinned 50/50. 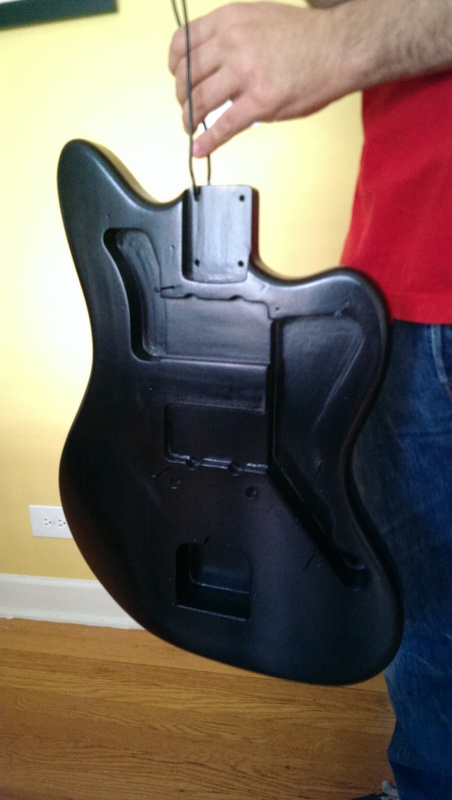 The guitar has 3 color coats, so that’s about 18 oz. of lacquer if there are no touch ups required. The cost of a quart of black lacquer is ~$20, so three coats comes out to $11.25. Also, I drop 20ml of black tint into the quart. I might be able to get away with less if I pour the clear into the the little glass jar, and then add the tint. Lastly, today I sprayed two coats of clear with a little over 3oz of lacquer each. So things might actually look better, although $20 for a quart of lacquer isn’t so bad (and less if it’s clear). Now to deal with not getting dust on the guitar while spraying clear. That’s proving to be really, really hard. More when I have a solution for that.